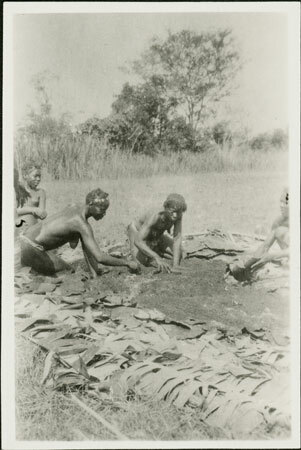 Women spreading out dampened malted eleusine to germinate on banana leaves, covering them with further banana leaves to protect them from the sun, ready for the next stage of beer (gbangara) preparation. Notes on card mount m/s pencil - "SS overall ?Fading 8.89"
Morton, Chris. "Zande beer preparation " Southern Sudan Project (in development). 03 Jan. 2006. Pitt Rivers Museum. <http://southernsudan.prm.ox.ac.uk/details/1998.341.240.2/>.